Ireland managed what had proved beyond Wales last week when they secured a comfortable victory over Italy in Rome to keep their Grand Slam bid on target. The Italians confirmed their progress with some bright moments but Ireland always looked a class above the hosts. Captain Brian O'Driscoll scooted over for his 18th international try to break Brendan Mullin's long-standing try record as the Irish ran in five tries in total. Italy's solitary try came from Dennis Dallan, but they showed enough to confirm that the victory over Wales was no fluke. Italy started in adventurous mood but they lacked penetration and Ireland forced the first real chance after 15 minutes. They kicked a penalty into the corner and when Victor Costello was held up just short from the line out, Peter Stringer burrowed over from the base of the ruck. David Humphreys had struggled with his kicking from hand but he slotted the conversion and added a penalty 10 minutes later to take Ireland into a 10-0 lead. The Irish pack impressed against the Scots last week and they again looked a solid unit as they began to put the squeeze on the hosts. A rumbling maul set up great field position and the Irish scored their second try of the match when Keith Gleeson sent John Kelly over in the corner. The Italians hit back almost immediately when Diego Dominguez slotted a simple penalty after O'Driscoll made a rare error. O'Driscoll nearly atoned with a brilliant run down the touchline, and although the Irish could not get up in support of their captain, a Humphreys penalty gave them an 18-3 lead. Dominguez missed an easy penalty either side of the half-time whistle and the Italians fell further behind when Humphreys hit the line at pace and raced over untouched from the hosts' 22. The fly-half could not add the conversion and, after Italy had replaced the out-of-sorts Dominguez with Ramiro Pez, the Italians scored their first try of the game through powerful wing Dallan. Pez converted and at 23-10 it looked as though Italy might come back, but Ireland reasserted their superiority. O'Driscoll knifed over for a converted try to break Mullins' record and although Pez slotted a penalty for Italy, Ireland had the final word as Humphreys converted Geordan Murphy's sparkling try. Italy: Vaccari, Ma Bergamasco, Stoica, Raineri, Dallan, Dominguez, Troncon, De Carli, Festuccia, Martinez, Bezzi, Bortolami, De Rossi, Persico, Phillips. Replacements: Moretti, Castrogiovanni, Giacheri, Palmer, Queirolo, Pez, Mi Bergamasco. Ireland: Murphy, Kelly, O'Driscoll, Maggs, Hickie, Humphreys, Stringer, Corrigan, S. Byrne, Hayes, Longwell, O'Kelly, Costello, Gleeson, Foley. 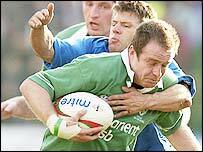 Replacements: Sheahan, Horan, Cullen, A. Quinlan, G. Easterby, Burke, Henderson. "O'Driscoll claimed a record 18th touch down for his country"